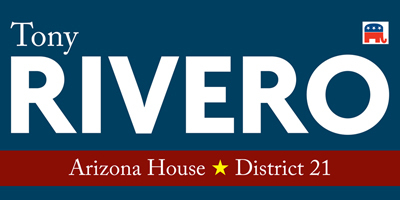 Thank you for your support of Tony Rivero for the Arizona House of Representatives in District 21! Tony is ready to bring his experience as a fiscal conservative and an advocate of the taxpayer to the Arizona Legislature. Your support will make it possible for Tony to have a positive impact on our state's economy. Please fill out the form below to make your donation, or if you prefer, mail a check to Tony Rivero for House of Representatives, 6767 W. Cheryl Drive, Peoria, AZ 85345. Again, thank you for your support!